Summary: Grandma, little child and the family pets are all napping peacefully until the tiny flea wakes them all up. A fun, cumulative story that begs to be read again and again. After reading The Napping House we talked about what time of day we usually sleep (the night). Is the sun out at night? (no) What is out at night? (moon, stars, owls, bats etc.) Then we reviewed some of the things we learned about the moon from the last letter lesson. Next I gave my girls a flashlight and had them go on a hunt for the letter Nn. (I had written the letters on paper and hung them in a dark room). They shone their flashlights around the room until they found a letter. When they found the letter they had to make the letter sound in order to take the card off the wall. They also discovered they could make shadows and had fun coming up with various shadow creations. We went over our letter N poem and handwriting sheet. My daughter usually traces the letters with her finger first and then traces with either a crayon or a big chunky pencil. I printed out the characters from The Napping House and we retold the story in the correct sequence. Next we talked about animals that sleep during the day and animals that sleep at night. Animals that are awake at night are called nocturnal animals. Animals that are awake during the day are called diurnal animals. Then we practiced matching the correct animals onto the right mat. After we had done that activity several times (over a course of a couple days) we sorted the whole collection of animal counters on the day/night mat. You can find the downloads for this activity on my ABC page under the Letter N printables. 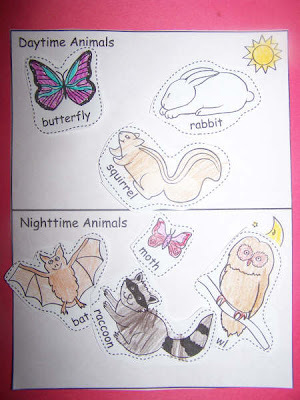 Shannon wrote about a daytime/nighttime animal cut-n-paste sheet in a previous Totally Tots article. This would be a nice additional activity to include in this unit too.